Health and Dental Coverage: Jumpstart offers comprehensive medical and dental with no deductible insurance plans with tiered options for an individual, employee plus one, and family, including domestic partner coverage; and up to 70% of the premium covered by Jumpstart. Retirement: Jumpstart invests in the future of our employees with a 100% match to the employee’s contribution (up to 4% of salary) in a 401k plan. Financial educational webinars and tools are also available. Flexible work schedules as well as telecommuting opportunities (dependent on position) offered. Additional Benefits: Jumpstart provides life insurance, along with long and short term disability coverage at no cost to the employee. Additionally, we offer flexible spending accounts (FSAs) for medical and dependent care; and transportation and parking expenses. 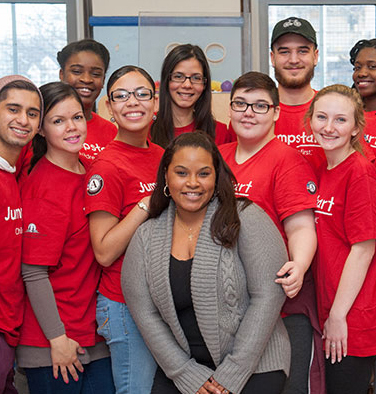 Full-time employees are eligible for all Jumpstart benefits. Part-time employees working at least 24 hours per week are generally eligible for all Jumpstart benefits. Temporary employees whose assignment is three months or more in duration, and whose work schedule is at least 24 hours per week, are generally eligible for most Jumpstart benefits.